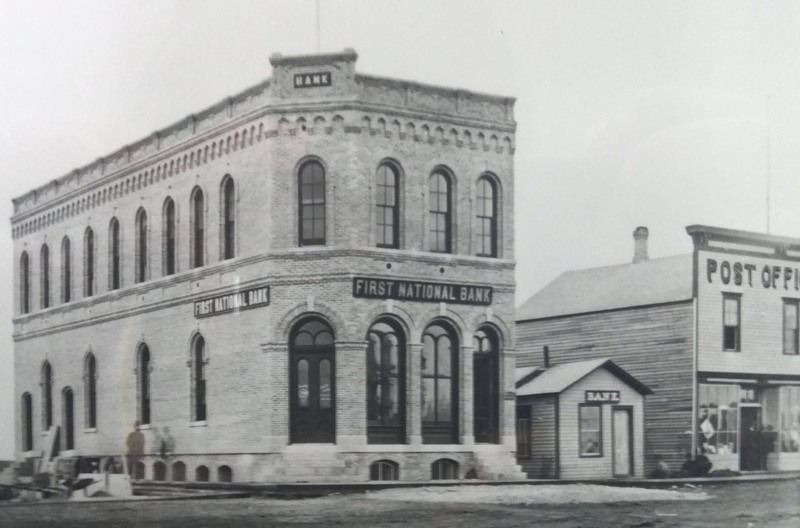 The First National Bank of Fargo was formed in 1878. At the time, Fargo was a rapidly growing city, and it required banks that could handle the influx of wealth and money. The First National Bank grew quickly due to the reputation of the bank’s president and vice-president, E.B. Eddy and M.N. Hubbard. 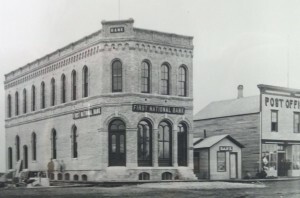 As is seen in the 1878 photograph, the town’s “first” bank is what looks like a shed is located to the right of the newly built First National Bank building. The building to the left stands two stories tall and was 25’ x 100’ in size. Decorative brick ornamentation adorns the top, and the arched windows and doorways add a sense of prestige to the building. The old bank was built from wood, and this eventually gave way to the two-story stone bank.